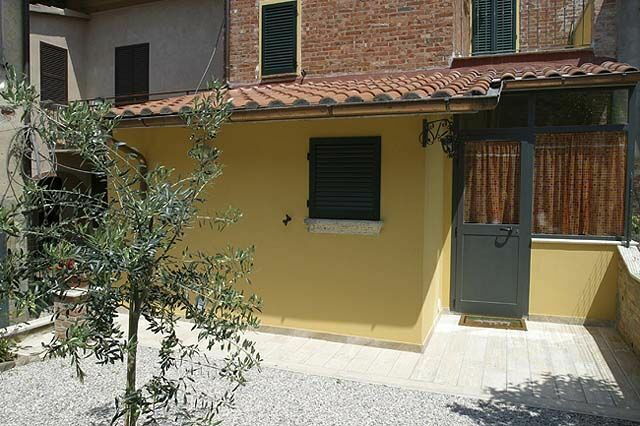 Holidays in Tuscany, in a villa or apartment. Small house quietly situated near the historical centre of Bettolle. The villa has been recently restored and turned into 2 nice apartments both offering nicely furnished interiors decorated in a Tuscany country manner. Distances: Bettolle with all kind of shops 150 m, the beautiful village of Montepulciano 15 km, Cortona 20 km, Siena 40 km. At guests’ disposal: private and furnished outdoor area for each apartment. Public parking at short distance from the house. Shared washing machine. Extra services: baby bed available on request (payment on the spot). Maid service available on request (to be paid on the spot). 50 m2. 1st floor: living-room (TV) with double sofa bed, kitchen corner (oven, freezer), double bedroom, bedroom with single bed, bathroom with shower. Small terrace furnished with table and chairs.